Dale Sheldon’s acrylic ‘Sunlit Crab Shanty’ is just one of many paintings on exhibit at Gallery One in Ocean View during the month of December. Gallery One in Ocean View this week announced the theme for its December exhibit, “Light Matters,” open to the public Dec. 5 through Jan. 1, 2019, ranging from the straightforward depiction of light’s illuminating effects to the more metaphorical emotions that the word “light” conveys. Artist Jeanne Mueller’s pointed out, “Do you feel happy if you wake up to a sunrise where the sun is peeping out as if to say, ‘Good Morning,’ rather than a gloomy, cloudy day? I know I do! Another day is dawning, and with it comes a new day filled with new adventures in life. “Sunrise at Cape Henlopen State Park” is Mueller’s oil painting of the sun coming up over the ocean. “Lilac Cottage by the Sea,” an acrylic painting by Jan Moffat, is her newest painting in “The Blue Door Collection.” Light and shadows set the mood, tell the viewer the time of day, and whether it is warm or cold. Light highlights details that are important to the painting. For example: the lace curtains on the blue door and the shadows on the path. Light has been an ongoing theme in artist Laura Hickman’s artwork, and this month’s theme painting, “Light, Korcula” illustrates that. “I love the play of shadows and light on clear, sunny days, when light is literally bouncing off one surface onto another, creating reflected colors within the shadows,” she said. Artist Lesley McCaskill’s watercolor painting “On the Move” embraces the theme of light in both a literal and a metaphorical way. The subject of the painting is a child (McCaskill’s grandchild), in her bathrobe filled with energy moving toward and bathed in the bright morning light after the darkness of night. McCaskill said the painting’s deeper meaning is about the innocence, vitality and positive outlook of a child. She aims to use softly broken brush strokes to show the movement and youth of the figure, and her use of light and dark draws attention to the subject. 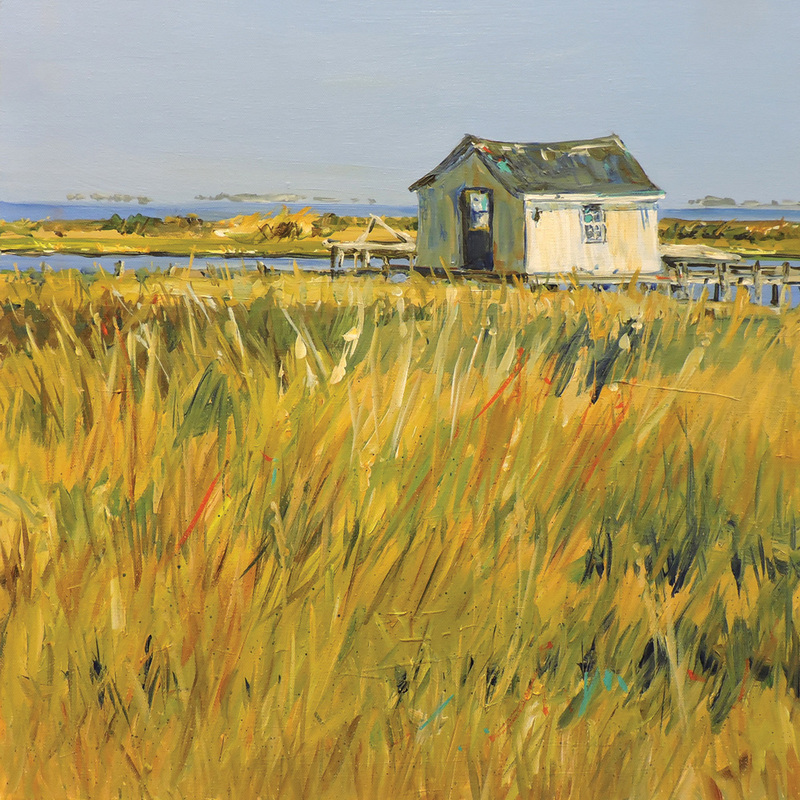 In the painting, the sun shines directly on one side of an old crab shanty on Virginia’s Tangier Island. It makes that side clearly visible, while the darker side recedes. Michelle Marshall’s acrylic painting “Misty Morning Light on the Marsh” is an illustration of the ebb and flow of light. The lost edges and obscured definition brought by the morning fog show just how important the bright light of day is in defining the familiar shapes people see in the landscape. The morning mist turns familiar surroundings into a more abstract and impressionistic reality. “Light Matters” runs from Dec. 5 through Jan. 1, 2019. In addition to the exhibit, the gallery’s Artisan Room features textiles, hand-blown glass, pottery, glass jewelry and wood pieces by local artists. Gallery One is open seven days a week from 10 a.m. to 4 p.m. and is always staffed by one of the artists. For more information, visit Gallery One’s website at www.GalleryOneDe.com, call (302) 537-5055 or visit the gallery at 32 Atlantic Avenue (Route 26).